UNFORTUNATELY, THIS ITEM IS NO LONGER AVAIALBLE. 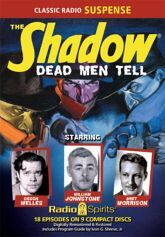 Orson Welles, William Johnstone, and Bret Morrison take on the role Lamont Cranston, "a man of wealth�a student of science�and a master of other people's minds"�and his alter-ego, The Shadow! Margot Stevenson, Marjorie Anderson, and Grace Matthews are heard as Margo Lane, the only person in the world who knew that Cranston and The Shadow were one and the same. Together, they face the frightening and demonstrate to "young and old alike that crime does not pay!"